I shouldn’t have been surprised when a recent discussion on the future of conservatism turned into an argument over Donald Trump, his presidency, and the midterm election. The renaissance in conservative thought that began with the publication of the Road to Serfdom in 1944, and culminated in the founding of National Review in 1955 and Conscience of a Conservative in 1960, gave way to conservative politics long ago. Since 1964, it has been difficult if not impossible to disentangle conservatism’s fate from the Republican Party’s. And for the last three years Trump has dominated that party and the movement associated with it. Neither Republicans nor conservatives ought to kid themselves. There is no escaping Trump. And conservatism may very well be about to take a body blow. The general election of 2018 begins with the Republican Party in a weakened state. Trump continues to be unpopular, the GOP trails in the general ballot, and the list of toss-ups in both the House and Senate continues to grow. Objective conditions—low unemployment, economic growth, rising incomes, no new wars—seem to have little bearing on evaluations of this presidency. Nor does the specter of what might come after the House Republicans loom large enough to spook independent voters away from the Democrats. This is a one issue election. The issue is Donald Trump. The loss of the House would foreclose the possibility of serious conservative legislation for at least two years. The loss of the Senate would slam the door shut on conservative judges and executive appointments. Newly empowered democratic socialists will push for impeachment. Pelosi and Schumer won’t know how to stop them. Conservative initiatives would be limited to Trump’s foreign policy, and to bureaucratic measures the next Democratic president will try to reverse. There is a lot of false hope being taken in Republican and conservative circles that, because Trump defied the polls in 2016, the party will do so again in 2018. Maybe. On the other hand, Trump was elected thanks to 77,000 votes in three states, and it could well be the case that the Trump spell works for him alone. His failure to make inroads among independents and Democrats over the last 20 months puts the majority party at a terrible disadvantage. Republican leaders are praying that he somehow changes his behavior or deletes the Twitter app in these last weeks before the election. This is wishful thinking. Trump hasn’t changed in three decades. He isn’t about to now. The Republican dilemma was brought into high relief on the morning of September 13. In between Tweets on the Russia investigation and the booming economy, the president questioned the official death toll in Puerto Rico from Hurricane Maria, saying the media “started to report really large numbers, like 3,000” a long time after the storms hit. “This was done by the Democrats in order to make me look as bad as possible when I was successfully raising Billions of Dollars to help rebuild Puerto Rico.” Leaving aside the niceties of the third-party study on which the authorities base their assessment, consider what Ron DeSantis and Rick Scott, who are running in a state where the Puerto Rican vote counts for a lot, must think about this particular intervention. GOP candidates are not only at the mercy of biography, presidential approval, the economy, and Democratic enthusiasm. They worry about the next notification in their timelines. I write at a particularly bad moment for the Trump presidency. His approval has taken a hit from Omarosa, Cohen, Manafort, the McCain funeral, Bob Woodward, and “Anonymous” of the New York Times. Because Trump’s numbers are like a water balloon—they tend always to reflate to the low- to mid-40s—there is the real possibility that he recovers his position by Election Day and the GOP is able to stave off the worst. He pulled it together in the final days of election 2016, barnstorming the country with verve, stamina, and humor. He could do so again. What must worry Republicans is the fact that the public has different views of candidate Trump and President Trump. Candidate Trump was seen always in relation to Hillary Clinton. President Trump is his own man, isolated, polarizing, and omnipresent. His supporters love him, and such devotion is the reason he is able to survive. It is not enough to maintain the Republican Congress. The loss of Congress in 2006 began a cycle of conservative defeats culminating in the election of Barack Obama two years later. If such a loss does occur in November, Republicans would rather have Trump follow the example of presidents Clinton and Obama. Clinton triangulated against the Republicans, Obama fought them, and both men won reelection. 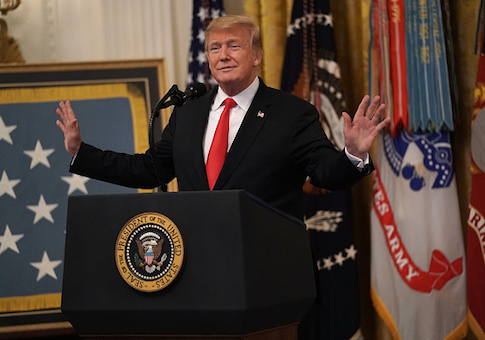 Trump would have a better chance of recovering lost ground by signing into law Democratic proposals for health care, ethics, and infrastructure, while vetoing budgets laden with welfare spending and currying sympathy by attacking impeachment. He could then count on the opposition exhibiting its own radicalism, its own flaws, just as it did in the one-on-one contest two years ago. Such moves would require tactical cunning and smooth talk. It could happen. The best conservatives can hope for is a reelected Trump passing his office to a Republican successor in 2025. That would cement the Republican transition into a party of socially conservative, working-class citizens. Being realists, we must also begin to contemplate a scenario in which the GOP and the conservative movement are on the verge of encountering the first of several setbacks. We can take cold comfort in the knowledge that we have endured such conditions before. Since the Reagan Revolution, neither the GOP nor the conservative movement has fallen to the nadirs of 1933 and 1975. Every time conservatism is pronounced dead, it recovers in the space of months. Ready to advance the cause of freedom. Eager to own the libs once more. The post There’s No Escaping Trump appeared first on Washington Free Beacon.